After nearly 30 years of publishing printed custom quick reference guides, Guest Communications Corporation (GCC) has launched the first electronic companion piece for the Guide to Guest Services™. 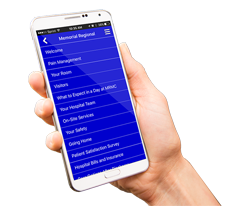 Our Services is a mobile application that allows users immediate access to the custom information your facility wants to share through their mobile devices. Whether you want to share patient and visitor information, a schedule of events or classes, health and wellness resources or general campus information, Our Services empowers your visitors, providing quick access to information whether they are on or off your campus. Our Services is custom. The app allows your facility to share your unique information. Our Services works, even if cell and internet service is unavailable! In certain locations, even within your facility, cell and wifi services are limited. Once installed on a device, Our Services allows your patients and their families access to the information you have shared, even if cellular connectivity or wifi services are unavailable. Our Services is quick and easy to use. The plan documents within the app are formatted to read like a flip-chart, making it very quick and easy for users to find the information they need. Our Services is easily updated. Keeping the content updated within the app is quick and easy. When updates are needed they can be submitted back to GCC and the edits will be incorporated your contents within the application. Upon your approval, the revised contents are then published for all users. Our Services was designed for use on Apple and Android mobile phones. It can also be used on Apple and Android tablets. The application is compatible with over 97% of all android and apple software versions. In simple terms, how does the app work? Our Services allows users to access your content through their mobile phones. Your organization will provide the content for the application to Guest Communications Corporation (GCC). GCC will then layout each individual page of the application, adding in functionality including one-touch dialing and hyperlinks to maps or websites. You will have a chance to review and edit the application contents and upon your final approval we will publish your contents within the application. How do our visitors get access to Our Services? Our Services is a free application that is available to all through Google Play and iTunes in the App Store. Once installed on a device, your end user can access your content through the application. They will see your facility’s listed content, and when they click on it the content will download to their device. This allows the information to be accessed at a later time, even if cellular connectivity is not available. How is content updated, or what happens if we need to add information? Our Services is designed to be easy to update and maintain. When changes are needed you simply advise us and we'll incorporate your edits into your content. Upon your final approval of the edits we will release the updated content to all users. How can our brand be reinforced through the application? Within the content provided to your users, you can reinforce your brand by using your logos, colors and images. For a more branded experience we can offer your facility a uniquely branded mobile application including your logo/name presented in the app stores. This is called a ‘white label’ version of Our Services. For more information on a white label, please contact us at 800-637-8525. What devices can the application be used on?